The best form of cedar house washing is prevention. Cedar has a soft, porous surface that can be easily damaged if isn’t looked after properly. Whilst it’s always important to be careful when washing exterior surfaces, particular attention should be paid to cedar homes. Assess the condition of the wood surface, stain or paint. Quite often, the stain applied to cedar is prone to marking and damage from any sort of water pressure or being brushed – even with a soft house wash brush. This is always more likely on the northern facing sides of the house. Use a soft-bristled house wash brush to remove any cobwebs before spraying water at the house. Once cobwebs become wet on a rough cedar house, they’re a nightmare to get rid of! Use a soft wash solution. 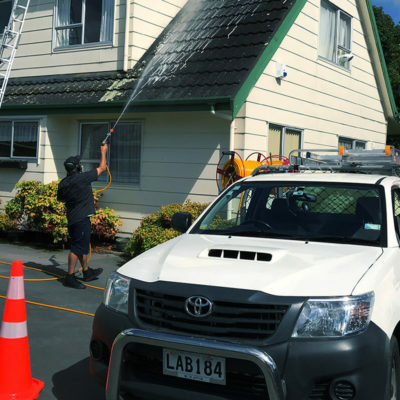 If you have a water blaster with a chemical venturi, use a mix of 5 litres household bleach, 4 litres water and 1 litre of dish wash liquid or sugar soap. This mix will then be diluted again to around 10:1 through your venturi. Apply the mix from a safe distance to ensure that you don’t cause damage from pressure against the house. Thoroughly coat the whole house and leave the solution for 5 minutes, then rinse off with water from a safe distance. Check out our soft wash guide to learn more about this method. Regular soft brush house washing will help to prevent mould and lichen from establishing itself on the cedar surfaces. This can be done without the need for external help – however, we find that many customers prefer to leave this to the professionals. Either way, make sure to keep on top of it to prevent future damage to your house. 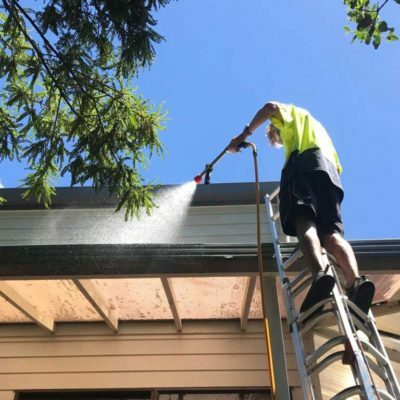 Mould and lichen growth compromises the coatings and surface treatments that are applied to cedar, so it’s best to keep your house clean to avoid these issues. Even low-pressure soft house washing equipment packs enough punch to cause damage to cedar surfaces if used incorrectly. Inexperienced house washers and moments of carelessness can permanently damage cedar – given how soft the wood is. Unless you have had enough advice to feel confident washing your cedar home, it’s a good idea to employ the services of a house washer that can clearly display adequate knowledge of cedar house maintenance. 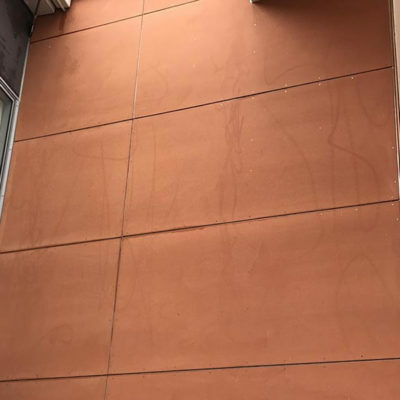 It’s important to be aware of the damage and impact that moss, mould and lichen have previously had on the cedar house coating or surface before washing, so that your expectations of the end result are accurate. If there has been sustained deterioration and oxidisation, it may be time to look at painting or restaining your home. In this scenario, it is highly recommended that you consult a cedar specialist to advise on the preferred method of preparation. Here is a helpful, informative article about cleaning moss, mould, and lichen. Do you need help with looking after your cedar house? 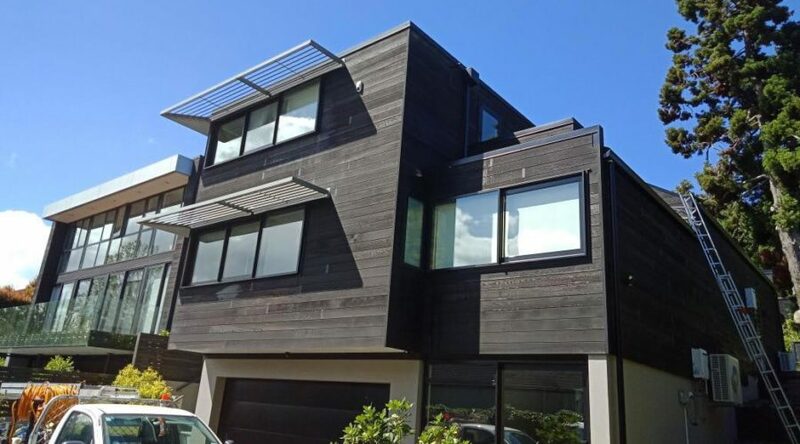 Out of all the different types of cladding, cedar is one of the hardest to maintain. Not to worry though, we have plenty of experience with this type of surface – and more than a few happy customers. Feel free to contact us today for a free no obligation quote.